"Another proposal that had originally been laid out but has since been redacted was the plans for a new basketball practice facility and academic center. The plans were scrapped after Mason men’s basketball coach Paul Hewitt advised against it, citing the Recreation and Athletic Complex as a suitable practice facility. In an interview with GoMason.com, Hewitt mentioned his approval of the basketball facilities and the privacy, accessibility and availability that the RAC provides. Since it was completed in 2009, basketball coaches including Georgetown’s John Thompson III, Marquette’s Buzz Williams and Minnesota’s Tubby Smith, while scrimmaging Mason, have raved about the RAC wishing they had something similar on their own campuses." So Paul Hewitt was against it? Of course the RAC is "suitable" but what's wrong with giving the program a face lift on campus and adding another recruiting tool? I can understand other sports like baseball, are in dire need of upgraded facilities but to me the basketball program does so much more for the university. I'm sure both VCU and ODU could use those funds to help out other sports teams on campus but they are putting their headline teams first. The RAC is a great facility but it's was meant for recreational sports and I don't care what O'Connor says, recruits would be more impressed with the team having their own dedicated facility on campus. To me this is just another example of how George Mason doesn't seem interested in building on the school's basketball brand and clearly others are willing to spend money to do so. It's pretty clear that O'Connor doesn't want to do a whole lot of work. He's in the twilight of his career and doesn't really have to do anything right to keep his job, just stop himself from doing anything wrong. Reference the lazy hire of Paul Hewitt; O'Connor didn't seem to do much of a "search," just sorta hired Hewitt because he was available and knew he wouldn't have to worry about another school counter-offering. So why would he front the money for a basketball practice facility? That's a lot of time and effort, and someone who just want to rest on his laurels and have the programs run themselves while he watches isn't going to make a push for that. I have my own problems with Hewitt but it really all stems from administration--the administration that shouldn't have let Larranaga go, the administration that shouldn't have hired Hewitt, and the administration that doesn't show much motivation to change things. So much of VCU's success was due to Norwood Teague being a go-getter. Look at Towson as well--they're making huge strides all based on a change of command at AD. Mason will just keep spinning its tires until a change happens at a higher level. I would love to see you interview O'Connor on this blog. What are the odds of that happening? Bad? I have in the past and never posted much of it because the answers are plain and very vanilla. Essentially what you see when he's on TV during half time of a game on CSN. If I can't ask the difficult questions and get real answers I figure what's the point? 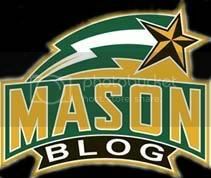 George Mason University is spending more money on academics then on athletics. They want to become the top academical university in the commonwealth. As frustrating as it is for Mason fans like myself, if that's their plan, then fine. You go to college to get a great education, and get a great career after college. GMU has done a great job improving their academical research and acquiring top level professors in Information Technology, Communication, Bio-science, and Engineering. Finally, I do think that TOC will most likely be gone after 2013-2014 anyway. Did they not put hundreds of thousands of dollars into revamping the patriot center last year? What would building another building for this low quality basketball team do? Its money that could be spent elsewhere. As it says above about the RAC coaches have "raved about the RAC wishing they had something similar on their own campuses." The problem is not the facilities, the problem is the team and the coaching.